Home Air Travel	My recommended Paris airport shuttle providing car seats and boosters? My recommended Paris airport shuttle providing car seats and boosters? Free car seat or booster for your ride? Kids under 5 free? Merci! As you might expect, having and traveling with three kids has been a real game-changer. Just figuring out a rental car that will fit two booster seats and a car seat—plus our baggage—can be a nail-biting and ultimately expensive challenge. And of course, there’s the thrill of driving in a different country after 24 or so hours of travel! Taxis don’t offer much relief either when there are five of you needing seats. And in some cities, such as Paris, taxi drivers will not take more than 3 passengers at a time. So for our recent trip to Paris, I was ecstatic to successfully plan more than a week’s vacation with zero driving required on my part. And no, we did not schlep all of us and our gear at night on the RER, nor did we walk from the airport. After comparing a number of Paris airport shuttle services, I discovered Allonavette would not only provide a car seat and safety booster FREE for our trips, but they would also not charge for children under 5 years old! This fact alone shaved roughly 30 Euros off the each-way rate for us compared with quotes from other services. Better still, we would not have to pay a dime until we were delivered to our destination (not so with some others), and even that we were allowed to pay by credit card rather than cash. Not sure what our cell phones (slash internet phones) would be doing inside Orly, we went with the rock star greeting (okay, I’ve done enough train and public transportation trips with baggage – I’m a sucker for the name sign!). The van, which in fact seats up to eight passengers, was parked just outside in a special waiting area. With a car seat already installed for my little guy, we were swiftly on our way. Would I recommend Allonavette to my friends visiting Paris with kids? Absolutely. And no, they didn’t pay a dime nor provide a discount to be mentioned here. Thanks, Allonavette, for easing our family’s arrival in Paris. Find them online at www.allonavette.fr. How about you? Are you planning a trip to Paris with your family? Have a great arrival tip to share? Please post a comment below! More help for your trip? Remember, you’ll find more trips for Paris travel with little kids (and other European destinations) in Travels with Baby Destinations, plus all the help you need preparing for overseas travel with your baby, toddler or preschooler in Travels with Baby: The Ultimate Guide. 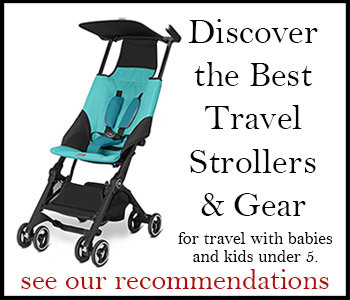 Do you know of a place to rent baby gear in Paris, such as a stroller? This is so good to know after schlepping 3 car seats to Mexico City last month! We are going to be in Paris next summer and this is such helpful advice! Travels with 3 car seats = No picnic! 😉 Glad this could help! I’ve got several more Paris tips you can browse in Destinations if you haven’t seen them yet: http://www.travelswithbaby.com/planning/destinations.htm#Europe have fun planning your trip! Thanks for the article and car based transport services. It will be helpful for me as well as to the readers viewing this.It is just providing a good service.